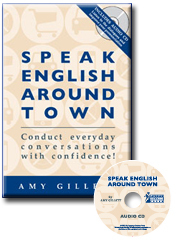 Language Success Press announces the release of Speak English Around Town, a new ESL book and audio CD for those who want to speak better English in their daily lives. This new book is the latest addition to the bestselling Speak English Like an American series. It's a fun read. I highly recommend it. Language Success Press announces the release of Speak English Around Town, a new ESL book & audio CD for learning everyday English. Through lively and realistic dialogues, Speak English Around Town teaches the expressions needed for everyday life. These are the expressions used when shopping, dining out, socializing with native English speakers, traveling around the USA, and during dozens of other daily activities. Speak English Around Town teaches hundreds of American English idioms and expressions useful for daily communication. It also helps the non-native English speaker stop making common mistakes when speaking. A special Language Lens in each lesson reviews grammar and structures known to cause trouble for English language learners. The accompanying audio CD lets the learner hear how English is really spoken and is designed to help with American English pronunciation. According to Sinan Lacin, an engineer from Turkey who currently lives in the United States, "The daily conversation examples are so common that you can easily find yourself in one of these situations and use the knowledge you recently gained from reading this book. If you're new to the USA, use this book as your daily dictionary. If you're a seasoned ESL speaker, then I urge you to challenge yourself, because you are likely to find more than a few examples in which you will catch yourself saying "oh, I didn't know that". It's a fun read, I highly recommend it." According to Tanya Peterson, marketing director at Language Success Press, Speak English Around Town can be used for self-study as well as classroom use. "We have already had two community colleges in the USA adopt the book for the classroom," says Ms. Peterson. Other books in the Speak English Like an American series are also used in ESL programs around the country, including at Yale University, University of California, San Diego, University of Connecticut and Drexel University. Recently featured in the Wall Street Journal, Amy Gillett is also the author of the bestselling books Speak English Like an American and Speak Business English Like an American. She has taught English as a Second Language (ESL) in Europe and in the United States. Speak English Around Town is now available for for $24.95 ($5 off the cover price) from the Language Success Press website.